I’ve had such a lovely day!!! Crochet brocade crochet group was at 10:30 this morning, we had 2 new people join us which was great!! Although we missed @itchycrochet this week, where were you Amanda! One of our ladies learnt to slip knot, chain and DC in the first week, and she’s been practising rows since then, so I thought I’d see how she got on in rounds, she did fabulous! We then had a lady walk over to join us, and she picked up a hook and yarn and before I knew it the lady who only started three weeks ago was showing her how to crochet! Yayyy!! Then a lovely elderly lady came over to our table, she reminded me a little of my Granny Muchy, the lady that inspired me to crochet, she initially came over to ask what we were making, then she started to tell us about the items she makes, and how she taught her children, she was one of those ladies that doesn’t mince her words, a spade is a spade (I like that) well before in knew it she was showing us how it’s done!! I’ve asked her to come back next week, but she didn’t seem overly excited by the idea!! 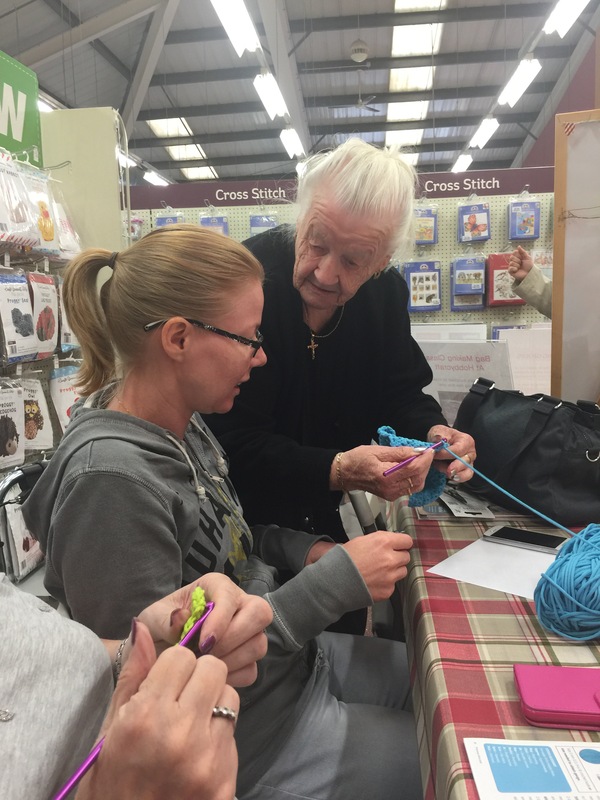 Then this afternoon I went over to event city at the Trafford centre, Hobbycraft we’re sponsoring the stitch and sew event, I was impressed by how busy it was! There were some great stands, not much in the way of yarn but there were a few yarn stands. I stopped off at Blacksheep wools stand and picked up a good bargain! All if these skeins of Aran should of been over £40, mine for £19.99! That’ll do me nicely thank you!! Oooh people like that really wind me up. There is no need to be rude. She could have politely told you they werent for sale, but directed you to the tools to make said card. Also, I love black sheep! Such good value! I once bought a pack of 10 balls of Noro Haniwa for just £40. Should have been somewhere near £80. I had always wanted to buy some Noro, but it is so beautiful I think its the sort of thing you want to make a big statement garment with, however, to buy enough yarn to do that was always out of my price range, until i found a pack on a black sheep stall! Yes!!!! Me too!!! I thought mmmm good job I don’t have lots of followers on my blog id name and shame! 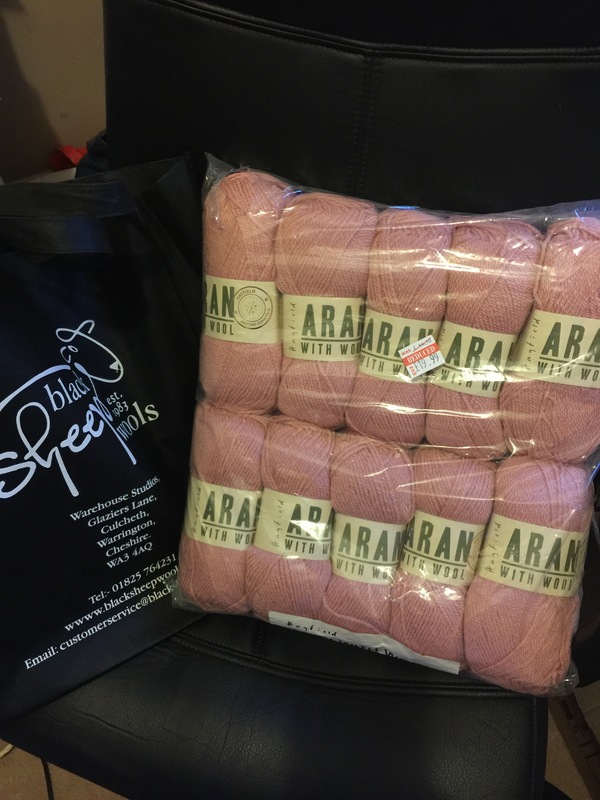 Are you near Blacksheep wools or do you order online? I’m only 4 miles from them which is not a good thing! I spend a fortune!! I am miles away. 213 miles to be precise. Its probably for the best! No me and my mum go together to the knitting and stitching show in kensington olympia, where black sheep always have a massive stall or two! Its a fantastic show. Theres one in october at ally pally and one in march in olympia. They have a competition you can enter into sometimes – last time it was a knitted feast so I crocheted an enoyrmous stargazy pie. I’m definitely going to that!! !